(All my data on this page is from JPL's "DE431.bsp"
(On this page, by "position of the Earth versus the Sun"
thus treating them as a single object orbiting the Sun). and repeated that whole fit process. term interactions of Earth with Venus and Jupiter. the spectrum in the picture above. It sounds to me like the engineering room of the Enterprise. Every component of the sound is some planet bouncing against Earth. detail you can right click this link and save the file. reducing the 64 bit floating point numeric data to 16bit integers. the time interval length (to 134 years in the first). full 11100032 days of "DE431.bsp". the amplitudes to increase the displayable range). a return of Earth to its position is measured across. length of the year is obtained. 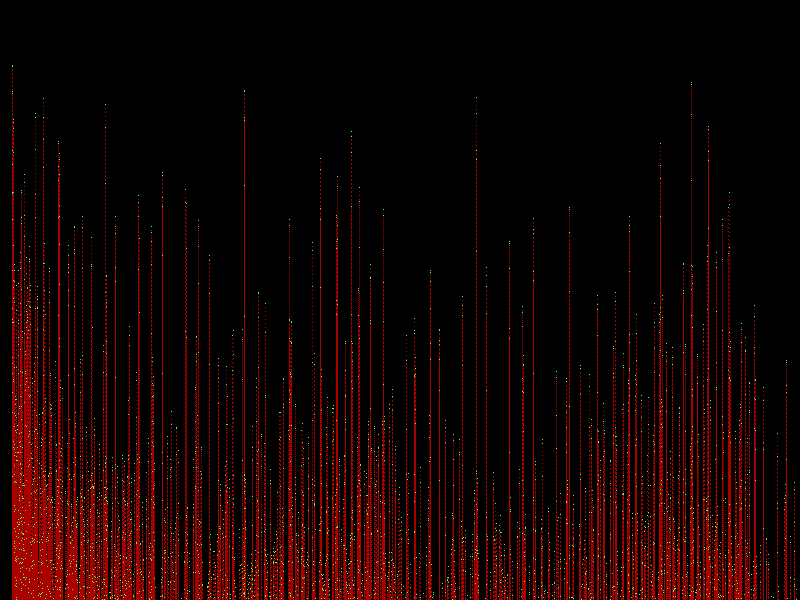 I applied a low pass filter to the data. 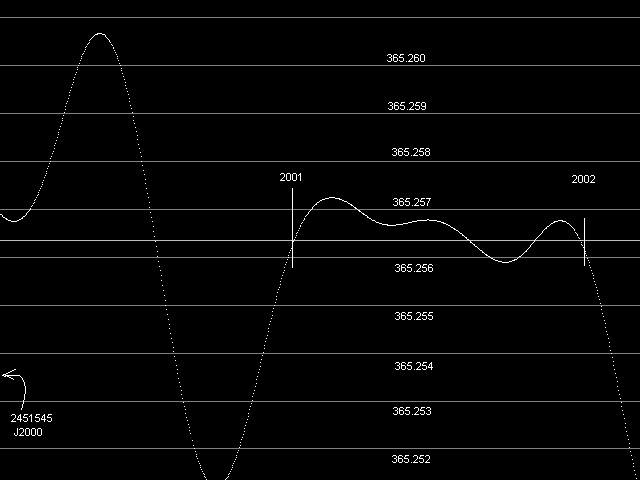 curving cutoff occuring near the cutoff frequency. A graph of the resulting data is shown in the following picture. and the vertical range is 365.256333 to 365.256393 days. and the other has a period of about 1783 years. for the length of the year is now possible. 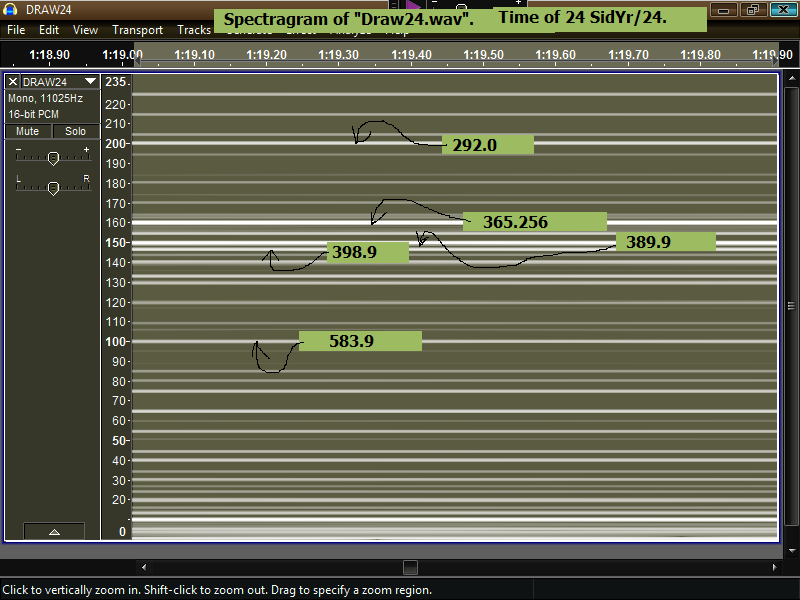 2^21 calculations of the "mean longitude of the Earth"
evenly spaced over the 11100032 day span of "DE431.bsp"
the value calculated by the "return to position" method. point also were around 0.2 seconds. or without stating an averaging period of over many human lifetimes. that need to be used unadjusted for many thousands of years. for the length of the year at the center of the data (1995.77AD). depending on the different ways of getting the measurement. in current SOFA online files). converting Sidereal Year periods to Tropical Year Periods. 2016.5...365.256374.....31558150.7....365 6 9 10.7........ by "meanlongitude method"
2000.0...365.256378.....31558151.1....365 6 9 11.1........ by "meanlongitude method"
1950.0...365.256376.....31558150.9....365 6 9 10.9........ by "meanlongitude method"
1947.0...365.256375.....31558150.8....365 6 9 10.8........ by "meanlongitude method"
1900.0...365.256358.....31558149.4....365 6 9 09.4........ by "meanlongitude method"
...0.0...365.256362.....31558149.7....365 6 9 09.7........ by "meanlongitude method"
-128.0...365.256374.....31558150.7....365 6 9 10.7........ by "meanlongitude method"
2016.5...365.242201.....31556926.2... 365 5 48 46.2....... by "meanlongitude method"
2000.0...365.242205.....31556926.5....365 5 48 46.5....... by "meanlongitude method"
1950.0...365.242207.....31556926.7....365 5 48 46.7....... by "meanlongitude method"
1947.0...365.242206.....31556926.6....365 5 48 46.6....... by "meanlongitude method"
1900.0...365.242192.....31556925.4....365 5 48 45.4....... by "meanlongitude method"
...0.0...365.242312.....31556935.8....365 5 48 55.8....... by "meanlongitude method"
-128.0...365.242331.....31556937.4....365 5 48 57.4....... by "meanlongitude method"
the usefulness of a calendar system. a year length to a precision of greater than around 0.2 second. 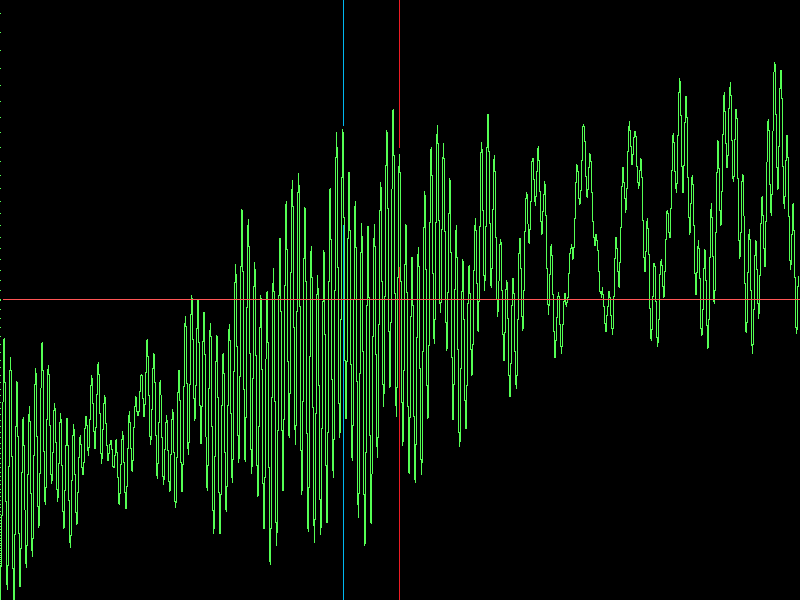 The line plotted in blue-green are values by the "meanlongitude method". The line plotted in yellow-green are values by the "return to position" method. Here are the main data files I used for this page. They are all about 16 megabytes in size, containing 2^21, sixty four bit floating point, LSB first, numbers. or 24 years after that (as explained below). 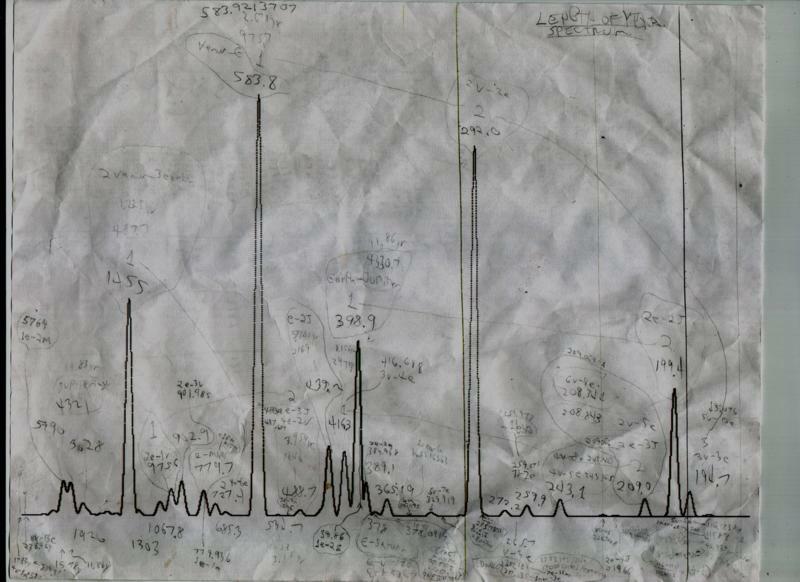 Each successive data point is 5.29... days after the one preceeding it. so they should be excluded from statistical analyses of the file's data. 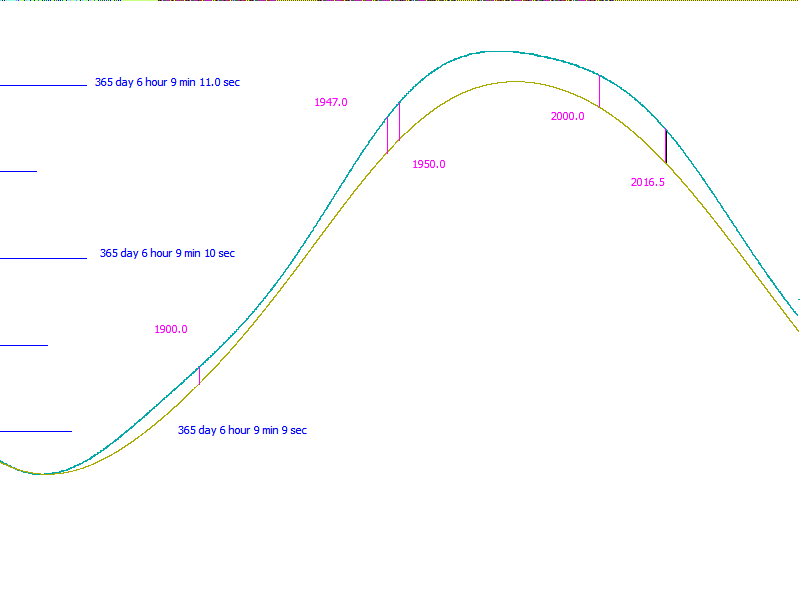 smoothlg.dat is the data for the "meanlongitude method"
(in other words it is just a list of Mean Longitudes of Earth every 5.29... days over a 30390 year period. smooth48.dat is the data for the "return to position" method. rather than the start point. machine language and had the data processing done on a solid state drive, now it takes only 4 hours to create the file. and x= 11100032/2^21 is the time step in the files. This page was written and first posted on 2016/04/11.